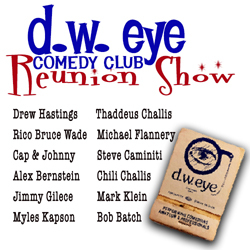 The D. W. Eye was a small hole-in-the-wall night club located at the corner of Calhoun and West Clifton. It opened its doors to comedy in October 1980. “The Eye” quickly became a nerve center for all comedy in Cincinnati, drawing huge crowds, and national headliners. But more than that, it was a place that nurtured Cincinnati comedy talent. Many of the guys who showed up every week for Open Mic Night at “The Eye” went on to not only be professional Stand-up Comics, but also Sitcom guest Stars, Second City Directors, Executive Producers, Game Show Hosts, Tonight Show Guests, Tonight Show Writers, Film Actors, and Authors. They’re back Friday, June 23rd for one show only at The 20th Century Theater.